LAST MONTH, we discussed a fantastic five-ball combination from Ralf Souquet in the final of the U.S. Open Straight Pool Championship. The Kaiser's combo kept him in the driver's seat, and he continued to extend his lead in the 150-point match. But his opponent, little-known Taiwanese cueist Chin Min-Wai, found an opening when Souquet erred on an attempt for his 108th ball. Facing a deficit of 107-79, Chin dropped the 3 ball in the side pocket, sending the cue ball to the head rail and into the position shown in Diagram 1. It doesn't take long to see Chin didn't have many options. But throughout the U.S. Open, Chin, though unfamiliar to many in the crowd, earned a reputation for a creative and fearless player, often attempting shots considered outlandish by Accu-Stats commentators and other players. In fact, it wasn't all that uncommon for Chin to draw a round of applause after missing a shot, simply because he showed the willingness and ability to try. 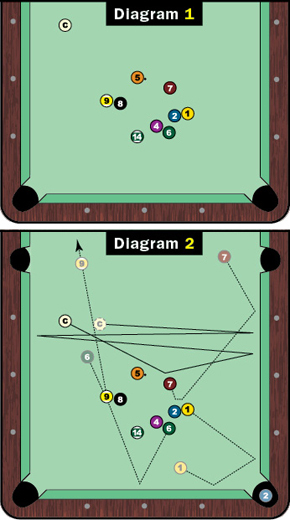 In this case, Chin called a combination-billiard on the 2 ball in the bottom right corner, a shot that requires a step-by-step examination to see all that went down (see Diagram 2). With the 5 ball blocking the 2, Chin sent the 7 ball into the top side of the blue sphere. The 2, with a little help from the 1, then contacted the 6 ball with roughly a half-ball hit. While the 1 rattled around the bottom right corner, the 2 rolled straight into the pocket. The cue ball sprinted across the table four times, while the 9 ball rolled into the jaws of the top left corner pocket, leaving Chin an easy ball to keep his run alive. But in the end, Chin's creativity was no match for Souquet's execution. The German eventually returned to the table and captured the title, 150-95.